The 2019 WWE Superstar Shake-Up was an important one since SmackDown Live is moving to Fox this fall and the moves with Monday Night Raw has an added significance. The Superstar Shake-Up took place on Monday Night Raw on April 15 and SmackDown Live on April 16 and included superstars from Raw, SmackDown, NXT and 205 Live (but not NXT UK). Here is a look at every move from the two nights of the Superstar Shake-Up. The biggest name to move from SmackDown Live to Monday Night Raw is former WWE Champion AJ Styles. It was a surprising move, but considering he is the biggest name on SmackDown, it makes sense. Now, Styles will get a lot of new fresh matchups, including possible matches with new Universal Champion Seth Rollins, down the line. 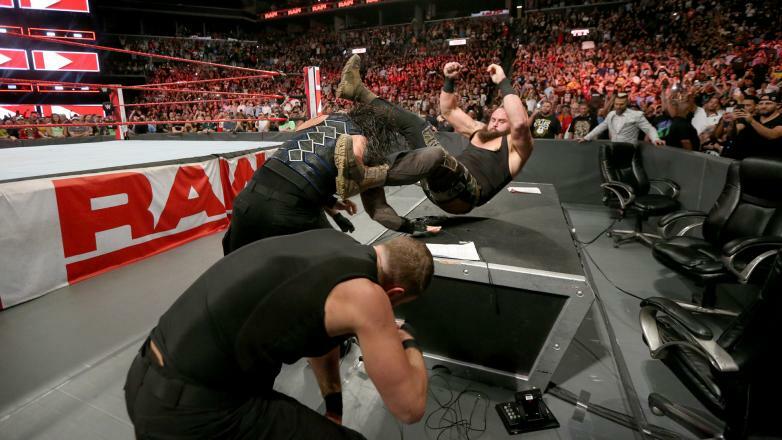 There was also a huge influx of NXT talent that came to Monday Night Raw. The current NXT tag team champions, The War Raiders, moved to Raw with a new name — The Viking Experience. Also remaining on Raw full-time now are former NXT stars Ricochet, Aleister Black, Lacey Evans, and EC3. The Miz is also a huge name to move to Raw — likely because he has his USA Network reality show that Raw can promote but SmackDown won’t once it moves to Fox. The Usos were the best tag team on SmackDown Live for years now, and they will get a chance to show their stuff on Raw instead. Finally, Andrade (with Zelina Vega), Naomi, Cedric Alexander, and Eric Young are moving to Raw. When it comes to Young, it also signifies the breakup of Sanity. Ther moves to SmackDown Live were not as big — but included possibly the biggest of them all. Roman Reigns has moved to SmackDown Live, giving the Blue Brand the biggest star they have had in years. He debuted in a segment with Elias, who made his move as well. Also moving to SmackDown Live is Intercontinental Champion Finn Balor (which makes us wonder where U.S. Champion Samoa Joe will end up — rumor has he is sick and that is why he was not on either show). For the women, a new tag team debuted on SmackDown Live with Paige introducing NXT star Kairi Sane who will team with former SmackDown Live women’s champion Asuka. Also coming over is Bayley, Ember Moon, Liv Morgan, and Mickie James. Former Cruiserweight Champion Buddy Murphy also announced he was coming to SmackDown Live and Lars Sullivan will also be full-time on SmackDown Live now as well. Finally, Apollo Crews is coming to SmackDown and Chad Gable will also move over, effectively ending his tag team with Bobby Roode. After SmackDown Live went off the air, WWE announced that Heavy Machinery was also headed to SmackDown Live. Sadly, while some wrestlers say that NXT is the third real brand (hello Johnny Gargano), WWE does not seem to feel the same way. While NXT lost their tag team champions (War Raiders) and their 2018 Wrestler of the Year (Kairi Sane), they didn’t appear to get anything in return. There are some Raw and SmackDown superstars who could use a change in scenery like NXT, such as Luke Harper, but they will likely have to go elsewhere if they want it now.